Welcome to Episode 1 in the How to Sew A Skirt Sew-along series. The subject for today is: Overview, tools and equipment and how to choose fabric. Let's have a look at the skirt we are going to make together. It's a simple skirt but flattering and versatile. Can be made in a casual fabric for days off or a formal fabric for days at the office or even from a glamorous and glittery fabric for evenings out and special occasions. Make it mini, knee-length, long or floor-length easily. The basic straight skirt is a wardrobe essential and once you have your custom pattern you can make a whole series of these in different fabrics knowing that each one is going to fit you beautifully without any fiddling about. The skirt we will make in this sew-along has a center back invisible zipper, darts front and back, sits just below the waist (or where ever you choose) and is fully lined. I'm going to concentrate on good sewing finishes and will show you how you can make a skirt that rivals many ready-to-wear in terms of its fit and finish. And mostly probably at a fraction of the price for what you might spend on a good quality skirt. To do a job well, you really do need the right tools and equipment. You won't need a lot and much of it you probably already have. Let's look at what we will be using. A zipper foot, having an adjustable zipper foot and an invisible zipper foot will work best but you can make do with just a regular zipper foot too. We will talk more about zippers later. Some time… a little at a time is fine. We will be using a woven fabric for the skirt, and nothing stretchy like a jersey or knit fabric. If you have a fabric ‘stash'you most likely already have something suitable, if not, then you'll need to visit your local fabric store. Fabric stores vary in how they are laid out, but you will basically find fabrics next to each other that have similar fibers and characteristics. If in doubt, ask one of the assistants for advice – tell them what you plan to sew and when and where you plan to wear your skirt and they can give you some suggestions. 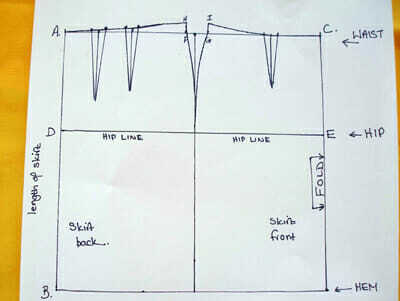 Unroll the fabric bolt a little and have a look at how the fabric hangs (called its drape). Do you like the feel of it? Is it soft or stiff? Is the fabric scratchy? Unroll a couple of feet and hang it from your waist. Does it look like this fabric is right for you? Would you wear this print in a skirt? Do you have something to wear on top that will go with it? Look at the fiber content and care instructions. Check the width of the fabric. A very narrow bolt such as 44 inches might require you to buy twice as much fabric as one that comes 54 or even 60 inches wide. Use plain colors or small prints. 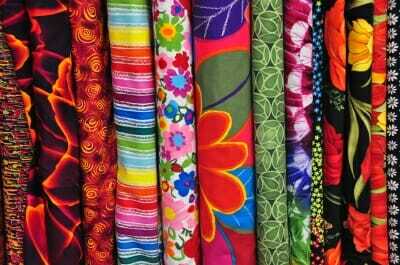 Avoid stripes and big patterns if you are new to sewing – it can be very difficult to match them well. We are making a full lining for this skirt. Of course not all skirts are lined, but it gives it a nice hang, makes it feel comfortable and expensive to wear, covers any seams on the inside, and can make the skirt last longer and prevent stretching out at the rear. A plain lightweight cotton or cotton Broadcloth. If in doubt, ask the store assistant for their advice. Your lining fabric will normally be a lighter weight than the outer fabric you have chosen. You will need to buy a piece of fabric that is wide enough to go around you once at your widest part, plus an extra 8 inches. It will need to be long enough to go from waist to the length of the skirt plus 6 inches. Generally speaking, assuming a 54-60 inch wide fabric, one yard would be ideal. Buy the same for your lining. However, if you have a large pattern repeat, and want to match the pattern at the center back seam, you will need to buy additional fabric to do that. Perhaps two yards depending on the length of your skirt and the size of the pattern repeat. A future episode will deal with pattern matching. A VERY important step before cutting your fabric is to prepare it. New fabrics will often/sometimes shrink when washed for the first time or even first few times. 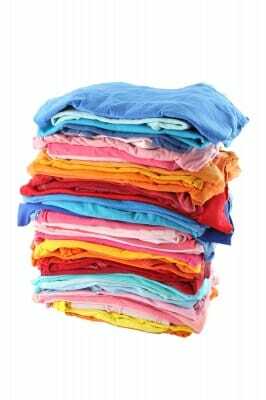 So you must wash, dry and iron your fabric in the same way that you would wash, dry and iron your finished skirt. Do this at least once, twice is better just to be sure. You can pin the fabric inside a pillow case to stop it getting too wound up in the machine and to reduce any fraying. Take note of any care instructions when you buy the fabric and ask at the shop if you aren't sure. Don't end up with a dry-clean only fabric for a skirt you plan to wear all the time or it will soon lose some of its appeal. If you want to learn more about fabric and which fabrics are suitable for which clothing projects, I can recommend a couple of good books on the subject. Join me soon for the next step in our Sew A Skirt series – Drafting your custom fit pattern, and all about ease and seam allowances. “If you have a ‘fabric stash’…” You know me so well!! And this series is a complete joy, I’m so glad I found it! It thrills me that I can do something practical with the quilting cotton I lust after constantly. It is inexpensive, easy-to-use and will probably last forever. You don’t need to splash out for a computerised model until you’ve really learned what you are doing and have fallen in love with sewing like we all have. Good luck with it and let us know how you go. great tips this is very useful thanks…. This skirt doesn’t have a waistband. Its a very simple version for beginners that just uses a lining instead. Much easier to draft and to sew for your first time around. Thank you so much for such simple instructions. Wish all were this simple and easy to follow. Just found you today and am going to make this beautiful skirt. I needed some new church dresses and this will work perfectly as I can change patterns and have several skirts. Now how about simple instructions for a short sleeve top. 🙂 You are AWESOME!!! Thanks again and God Bless. Thanks for leaving a comment Barbara and I’m really so glad you’ve been finding my article useful. I have a cowl neck top coming to the site later this month which has a sleeveless version or 3 different sleeve lengths, and its not too difficult. Keep you eye open for that one, might be just what you are looking for. Or you could try the Julia top from Seamingly Smitten that I sewed and reviewed towards the end of last year. Its a quick and easy sew. Thank you for taking the time to post your, “Sew a Skirt Series….. I have been reading up as I want to make a skirt for myself. Your tips, and easy read patterns with graphic’s is wonderful. I will keep following your tutorials. Cheers! Awesome tips and tutorial Deby I love reading you! Thanks so much for sharing this. Thank you for the feature on your site – the series was very much requested by my readers but the comments have been a little slow so I hope your feature will help me to promote the post to a wider audience. There’s still lots of great lessons to come. Stopping by from the Pin Me Linky Party over at Diana Rambles. Just wanted to thank you for posting. This was perfect for a beginner like me. Very useful! Great tips. I make my own clothes from bought patterns and many years ago leaned how to draw my own patterns but have forgotten completely so I’m looking forward to future posts. Visiting from Sew Many Ways. This are fantastic tips! I am an experienced seamstress, and these are very good tips for preparing for a project! A lot of good information and tips! The skirts are very cute. I don’t sew a lot of clothing, but you are making it tempting to start back up! Very helpful. I’m looking forward to future posts in this series. Great tips! I am a newbie to sewing, so super-clear instructions like this are very helpful! I popped over from Or So She Says…thanks for sharing!